There is a story told that Napoleonic prisoners of war were not allowed to travel more than two miles from where they were held in Chesterfield. To overcome this and allow them to attend mass at Wingerworth, Sir Henry supposedly had a milestone moved to make it appear that Wingerworth was closer than it actually was. The milestone in question is located on Longedge Lane north of the Lychgate. 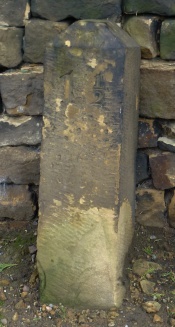 It is inscribed with the figures 1½, if there was any other lettering then it is too badly eroded to decipher. So presumably this indicates 1½ miles from Chesterfield which makes it within the regulated two miles for the prisoners to attend mass in Wingerworth. The validity of the story depends upon where the prisoners were held in the Chesterfield area. If they were located on the north, east or west side then it could be possible but the south side of Chesterfield is barely two miles away anyway. In an article23 by Elizabeth Eisenberg she goes into more detail about this milestone – ‘When Chesterfield was filled with French prisoners of war captured from Napleon’s forces, there was no place in the town for them to worship and Sir Henry Hunloke, squire of Wingerworth at that time, invited them to come to worship at his oratory. The Follies Fellowship25, Issue 15: July 2008, gives a similar account except they suggest that it was Sir Thomas who ordered a group of estate workers to dig it up and move it beyond the gates to his estate so his invitation could be accepted.